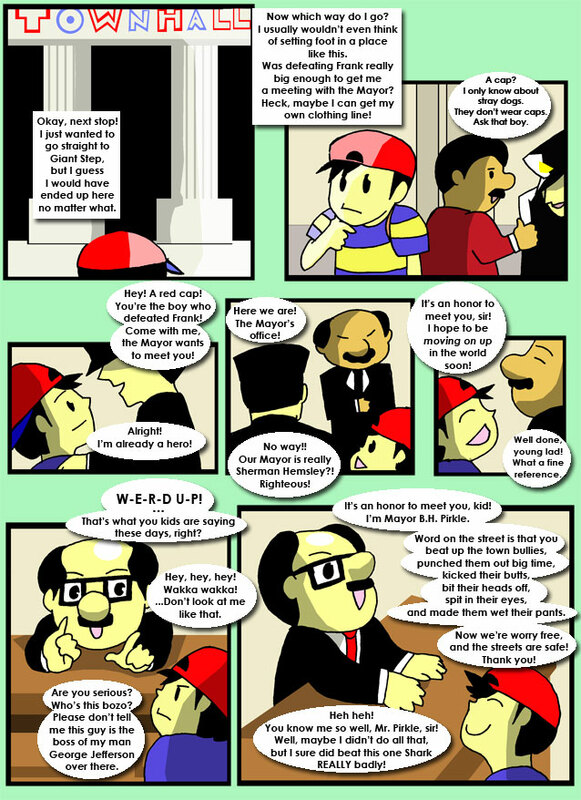 Ness heads over to the mayor's office to speak with Sherman Hemsley, but instead ends up talking with Pirkle. If you ask me, they picked the wrong person to be mayor. With Everdred knocked out of the picture, Ness can now continue...but to where? When in doubt, check the player's guide! Orange Kid appears in all of his juicy glory. Unfortunately for Ness, he's about to learn a lesson in lending fruit kids money to make crazy inventions. A lesson that we all should learn at one point in our lives. Ode to Orange Kid - by...Orange Kid. This is to be sung to the tune of Ode to Joy, so if you wish, synch it up and sing along. Afterall, we must give praise to our glorious leader...Orange Kid! Ness finally gets fed up and gives Orange Kid his just desserts. Too bad for Orange Kid those desserts happen to be full of pain...and not orange filling.